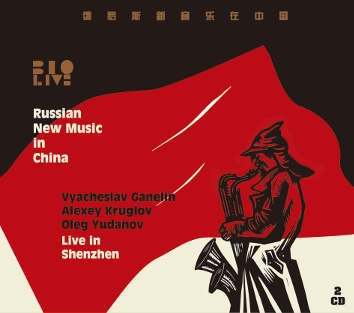 Vyacheslav Ganelin: piano, synthesizer, drums, percussion; Alexey Kruglov: alto and soprano saxophones, basset horn, saxophone mouthpiece; Oleg Yudanov: drums, percussion, gongs. Recorded 22nd October 2014 at the LOFT Jazz Festival in Shenzhen, China. Part 1, Ganelin’s solo performance is overflowing with arrangements and orchestrations that bring with them emotion, excitement and passion. Great, churning passages of sound that seem to embroil the entire scope of the pianoforte impose colourful rhythms that nourish the stance and disposition of the piece. The music is always in motion, often in unexpected hurly-burly. The duos of Part 2 are much lighter in weight and between the four of them there are perhaps much less intense colour, though the subtlety itself lends vibrancy. The exchanges between woodwind and percussion are a discourse of ecstasy and euphoria, stimulating contagion in the audience which responds enthusiastically. The piano returns in Part 3, but it is the saxophone which governs initially, the piano gradually joining it to the fore, though all three musicians contribute to the changing levels of musical agility, frenzy, inimitability, originality, rigorousness and stupor that their discrete instruments inveigle, as they explore the almost invisible boundaries of that sense of aspherical space which they have provoked. I hear that the audience responded with a standing ovation lasting for 10 minutes and believe me it was deserved, though thankfully it’s not on the disc! Enjoyable every second of the way.